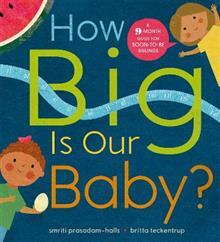 When a new baby is on the way, siblings-to-be have lots of feelings and plenty of questions. But whether they're impatient, curious or a little worried, this friendly and reassuring guide explains each step of the pregnancy journey and helps little ones feel involved and excited. With a month-by-month approach that compares the size of the growing baby to something familiar to the young reader, such as a speck of sand at the seaside or an egg, readers also find out about how Baby is developing, from when the heart might first beat to when they'll be able to feel it kick. The book also includes information about how life might change once Baby arrives, but how it will always be exciting it will be to have a new baby brother or sister. Smriti Prasadam-Halls (Author) Smriti Prasadam-Halls is the author of over 25 books for children. Her I Love You Night and Day was read on CBeebies Bedtime Hour and her Black and White Sparklers series has sold more than 250,000 copies worldwide. She lives in Richmond with her husband and three sons. Britta Teckentrup (Illustrator) Britta Teckentrup is an illustrator, fine artist and writer. She was born in Hamburg, Germany, and went on to study at St. Martin's College and the Royal College of Art in London. Britta has created over 40 books, translated in 20 languages worldwide, and her artwork has been shown at exhibitions all over the world. She lives and works in Berlin with her artist husband and their young son.